This So Much Pun! 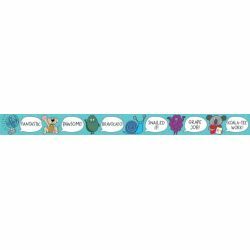 Positively Punny Border features humorous puns to encourage students and add a dash of fun to the classroom. This colorful border will brighten any bulletin board or display! Especially great on those highlighting student work and special accomplishments. The puns featured on this bulletin board border are Bravo-cado, Fantastic, Pawsome!, Snailed it!, Grape job, and Koala-tee work!